St. Pierre and Miquelon | ride. travel. live. This slice (officially an overseas collectivity) of France lies off of Newfoundland’s coast, a tiny territory that’s sparsely populated, and a bit surreal in that you find yourself landing in a place that flies the French flag, operates on 220 V and Euros, with the familiar French city and street signs, all of this a 40 minute flight from St. John’s. Weird. It’s evidently not that touristed, and there’s a general lack of English-language websites and literature on St. Pierre and Miquelon. So here goes, a few of my observations from three days on St. Pierre island. 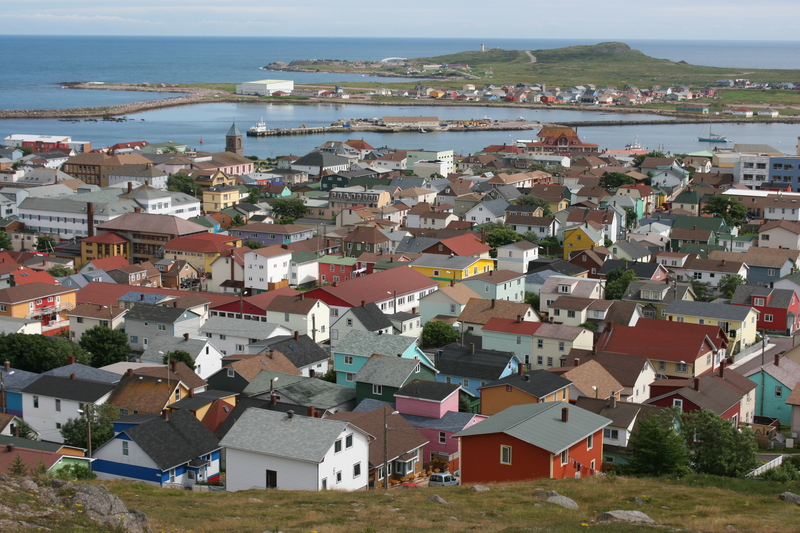 I took the short flight from St. John’s to St. Pierre, in the process going from chilly rain to a sunny, humid day. The signs were the first giveaway that this was France, in fact the sole remnant of New France still under French control. Yes, you can walk to and from the airport into town. I was offered a ride by a lady, who dropped me off at the Hotel Robert in central St. Pierre. The hotel was nothing special, a rather bare-bones room (100 Euro / night) that was rather noisy since it overlooked the main thoroughfare in the city. Despite being around 6000 people, there are a lot of cars. No doubt it’s necessary to have one to get around during the winters, so instead of the small cars normally found in France, many of the cars were the large American trucks and 4WD vehicles. 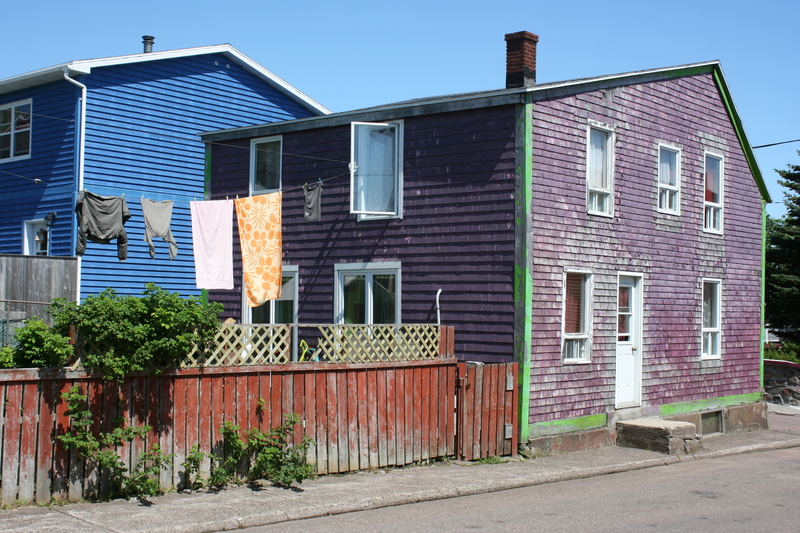 St. Pierre is a remarkably colorful town, although with nothing especially notable or old. A 20 minute walk out of town brings you to the wilderness, which is basically lots of rugged hills, dense, ground-hugging vegetation that was very green when I visited in August, and sparse trees that grow barely above your head. It’s also covered in these small ponds (étang), some blooming with lilies and flowers, others stagnant bodies of water with frogs jumping around. This is not the grand scenery of the Rockies that I’ve gotten used to, but it’s genuinely subarctic. The food was a bit disappointing compared to what I had been eating in Montreal. St. Pierre is small town France, and it’s a pretty limited selection of restaurants and shops. The hours take some getting used to, businesses are usually closed between noon and 2 PM, dinners start after 7 PM. And the time zone is strange, west of St. John’s, Newfoundland, but 30 minutes ahead of St. John’s time. The sun rises and sets late around here. The TV channels are a weird mix, I got French TV, some Canadian TV, and US TV from the major network affiliates in Detroit and Rochester, go figure. There’s one bank, where I exchanged money at a crappy rate, and the ATMs don’t take debit cards, only credit cards. In other words, use your credit card, or bring cash to change into Euros. Don’t expect regular schedules, either, ferry docks are not posted, and transport is irregular. Reserve hotel rooms in advance, as accommodation is limited. 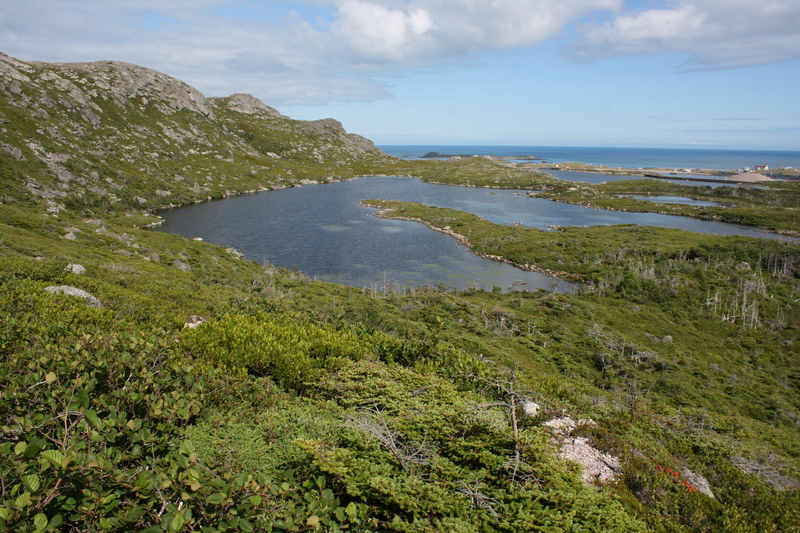 I covered several sections of St. Pierre island on a network of hiking trails. 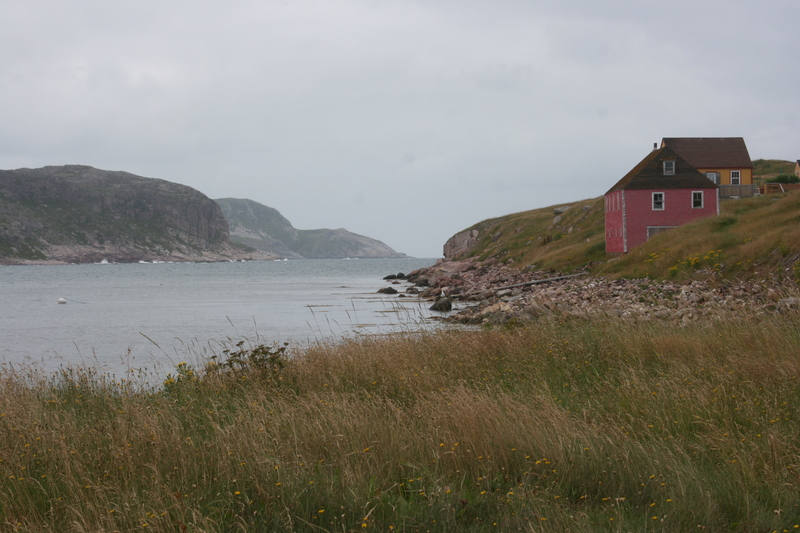 They all were similar in scenery, with the added bonus of sea views, and views of the cliffs of Miquelon. Newfoundland, despite being only 15 miles away, is not that clearly seen and usually lost in the haze. So it really does feel like a far-off, exotic island, even if it’s virtually surrounded by Canada. On my final day in St. Pierre, I took yet another walk among the tundra and etangs northeast of town, then hopped on the short ferry to L’Île–aux-Marins (Sailors’ Island), located just beyond the harbor breakwater, and this was probably the highlight of the visit. It’s a semi-ghost town, once housing nearly 700 people, now just 60 houses and a handful of summer residents. Its last permanent residents left in 1965. 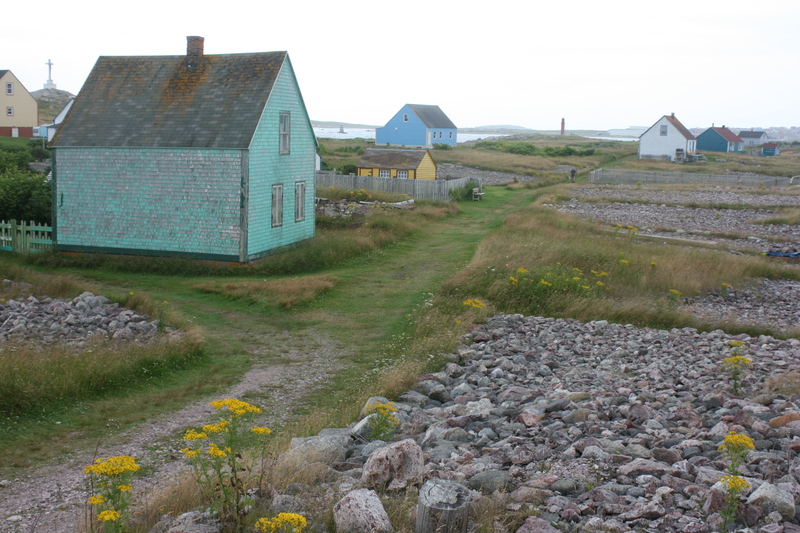 The ‘streets’ are pedestrian grassy pathways that go from one end of the island to the other, past large swaths of stone fields (graves) once used for drying fish. So instead of wheat or grass fields, the plots are covered with stones and demarcated by little grassy medians. The houses are slowly crumbling, with lots of collapsed buildings and foundations, and the ones still standing are picturesque in their bright colors and peeling paint. It was a remarkably calm three hours drinking in the views, feeling the grass under my bare feet, and photographing the scenery. 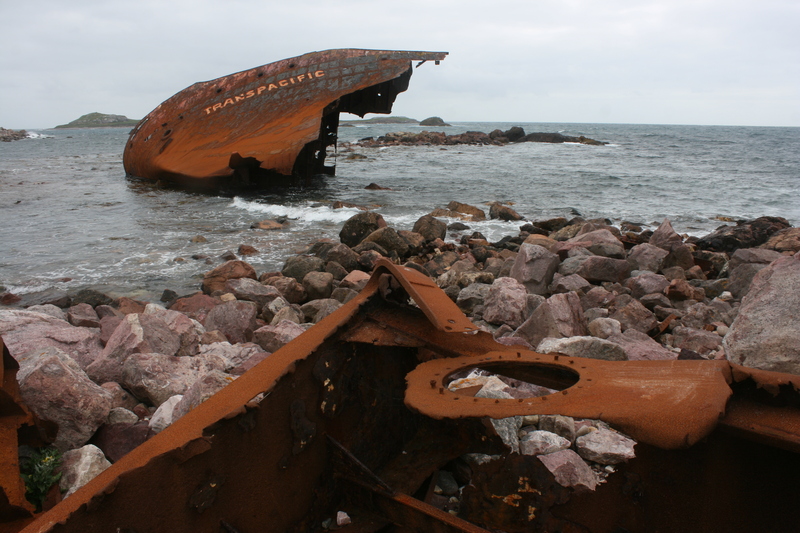 The northern end is marked by the crumbling, rusting shipwreck of the Transpacific, a German vessel which ran aground in 1971. The adjoining beach is unfortunately pretty dirty with all sorts of debris and garbage washed ashore. On the southern end is a little lighthouse decked out in purple. Everything here is a riot of colors, no doubt to brighten up the harsh winters and generally crappy weather. And that was the end of my visit, I gathered my stuff back at the hotel, and walked to the airport, a one-mile walk. A 40-minute flight later and I was back on Canadian soil in a foggy St. John’s. il devait bien être au courant ce monsieur qu’il ne venait pas au paradis ! si il n a pas aimé son séjour quand meme il n avait pas a etre si négatif. pas besoin de gens comme ca a venir a sp qu il reste ou il est.